What does excessive heat do anyway? Probably less than you imagine, since a CPU’s failure increase is a direct function of the number of thermal cycles and the CHANGE in temperature above ambient. One of the two mechanisms of failure is called “thermal fatigue” a misnomer since it is metal fatigue. 1. Temperature Range: Delta T is a function of ambient and Steady State or equilibrium conditions. Too high a delta T and temperature goes up yielding increased leakage. Ic current flow that will increase junction temperatures and increase the total delta T per cycle. Minimizing the magnitude of Delta T is one of the most important design parameters. The degree by which the CPU etc. increase in temperature beyond ambient is a function of heat sink efficiency and rapidity of heat transfer. In an ideal world the heat sink’s temperature equals the junction temperatures. 2. Thermal Cycles: Degradation due to thermal cycling (turning the computer on and off) is one reason there is some validity for 24/7 operation. You have to balance mechanical fatigue against how many Kwh per year are spent running 24/7. Once a critical temperature is reached, leakage currents become a progressively larger and self “feeding” problem. 3. Voltage: When over-volting a CPU, the internal heat generation is considerably greater since increases in voltage normally yield an increase in current flow: Elementary my dear Watson – Volts x Amps equals Watts. PS: Freezing CPUs also constitutes a delta T but at a reduced current flow due to the lower temperature reached with active cooling. Temp ambient is still the starting spot and the magnitude of delta T is directly proportional to failure rate. it’ll take for another 2% of the remaining CPUs to fail, and on and on. If the results suggest that a CPU can reasonably be expected to live for 30,000 hours, that’s what they’ll put on the spec sheet. manufacturers have their own special year :-). This makes estimated lifespans less relevant than many people think. A device built with a bomb in it that blew up after 1001 hours of operation could have a MTBF of 250,000 hours, if the evaluation units were only tested for 1000 hours. More than a few emails to Overclockers.com seek answers to two questions – What does oveclocking do to my CPU’s life expectancy, and What is the optimum operating temperature for my CPU. The following equations should shed some light on these questions from a theoretical viewpoint. CPUs dissipate heat at known rates. Intel lists these rates for each of its processors in their Developer Notes. For example, the Celeron 366 dissipates 21.7 watts. Any cooling solution must be able to effectively shed this heat load. Note that this heat is at spec speeds and voltages – when overclocking, more heat is generated than this. Therefor overclocking this C366 raise the heat dissipated from the spec of 21.7 watts to an overclocked rate of 43 watts, a 98% increase. What then is the impact on CPU Life? This depends on the amount of heat generated and the cooling efficiency of your CPU cooler. The Estimated Overclocked CPU Temperature is 40 C compared to the estimated spec rating of 32.6 C. So now we know the difference between running the C 366 at Intel’s specifications and the overclocked settings: 7.3 C. More heat will result in decreased CPU life. Thanks to the High Performance PC Guide and Global Win, I found a formula which explains the relationship between Heat and Life Expectancy. CPU Life and Temperature are inversely related – the higher the temperature, the lower the CPU’s Life. This holds true for all integrated circuits – heat is the enemy! What this formula shows is just how this relationship works and its potential impact. Now “Normal Life Hours” means that the CPU has some expected life at Normal Temp, say 30,000 hours. If the CPU is run at a higher temperature, CPU Life is degraded by the ratio of the New Temp to Normal Temp raised to the power of M. The number 273 is a constant in the formula. M is determined by real life temperature tests – The CPU is run at a constant 60 C, then 70 C, and the resultant decrease in CPU Life determines M. Let’s plug in some numbers and see what we get. For this case, I have used 30,000 hours as “Normal Life” and calculated the impact of temperatures from 25 to 75 C, for 3 cases of M – let’s call the three cases the “Hardy” CPU, the “Average” CPU and the “Weak” CPU. The Hardy CPU is not too affected by temperature, while the Weak CPU wilts very quickly in the heat. 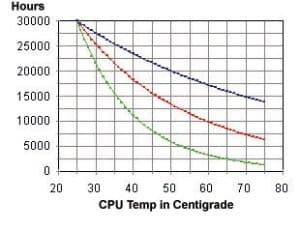 The important point here is to demonstrate how heat can impact CPU Life over a range of conditions. The Graph shows the relationship for the three cases outlined above, with “Hardy” on the top line and “weak” the bottom line. As you can see, depending on the CPU’s “hardiness”, CPU Life can be impacted a lot or not too badly. However, it is interesting to note that in all cases there is more absolute degradation closer to Normal Temp. For the three cases shown, the “Hardy” CPU, if run at 75C, will live for 13,814 hours, the “Average” CPU 6,361 hours and the “Weak” CPU for a puny 1,349 hours. Don’t buy that one! Now don’t take these numbers as absolutes – these cases are representative and intended to show relative impacts of temperature on CPU Life. I don’t know what Intel’s “M” is and, as you can see, it plays a big role in projecting CPU Life. I would love to hear from someone “inside” who might be able to supply an “M” based on some testing. However, based on experiences with Intel CPUs, I think it is safe to say that they are a lot closer to the “Hardy” CPU than the “Weak” CPU. Now let’s plug into this equation the impact on the C366’s life between running the Running the CPU at spec and overclocking it. A heatsink of .35 c/w will result in a CPU temp of 32.6 C at spec for an expected life of 23,321 hours (“Average” curve). Overclocking the C 366 with the same heatsink will result in a CPU temp of 40 C resulting in an estimated life of 18,359 hours, a difference of 4,962 hours. Now what does this means? If you run this C 366 flat out for an average of four hours per day, running at spec will result in failure in 16 years. Running the same CPU overclocked will result in failure in 12.6 years. How long did you keep you last CPU? All of this assumes you are running the CPU flat out – in the real world, this does not happen. Most of the time the CPU is loafing along – if you use a CPU idle program like Waterall or CPU Idle, the CPU can be running at 1% of its rated power at rest – like when you are doing some word processing and pause to look at your work. The fact is that CPUs just do not work all that hard all the time, and as such life expectancy is increased by these under-powered conditions. In addition, there is “power-up” stress on the CPU just by turning your system on and off, which can decrease life even for a non-overclocked CPU. There is a message here – Heat does degrade and in a measurable way. Heat will kill your CPU, and the more heat, the quicker. It should be your objective, overclocking or not, to run your systems at the lowest possible temperature. Whether or not the projected CPU Life coincides with economic life is a decision we each make and obviously impacts what you will tolerate as to how hot your CPU runs. Now there is something interesting here, although I’ll be the first to say I don’t know how much it holds up, but if you run the CPU under Normal Temp, you should see an increase in CPU Life. How much? Well, If you run the CPU at 0C, the “Weak” CPU will last for 46,493 hours, the “Average” for 72,054 and the “Hardy” CPU for a whopping 173,059 hours, all compared to the “Normal” of 30,000 hours. We have all seen performance increases at reduced temperatures, so it is not unreasonable to see increased CPU Life as well.